This has been an absolutely *beautiful* summer here, and your Catholic Librarian is basking in it. :) We have had zero 90 degree days, and only 3-4 humid days in the 80's making sleeping uncomfortable without air conditioning all summer. It has been *spectacular*. As many of you know, I don't enjoy really hot weather. Luckily, I live in an area of the country that often sees record snowfall in the wintertime :0 so I'm golden. We have a lovely climate up here, but sometimes the summer can get humid. Not this year, my friends! Just watch. Now that I've said that, a heatwave will roll through that will singe my hair off, but hope springs eternal, no? -2- Copper metalskin? Is that name of a heavy metal band?! -3- Big girl beds for everyone! Anne is outgrowing her crib, and so we've made the painful choice to buy her a bed. I always hate this transition. :-\ Suddenly, the child is *loose* in their room when they're supposed to be falling asleep. This seems very dangerous, indeed. But it's time, and she's excited about it. So, we've been doing lots of comparison shopping. I'll keep you posted on how this goes. -4- Are babies ever really this small?! When I wrote to Corinna to let her know that the post is up, she thanked me and let me know that she was working on editing book 2. I told her unceremoniously to EDIT.FASTER.GIRLFRIEND. :0 Can't wait to keep reading this series! 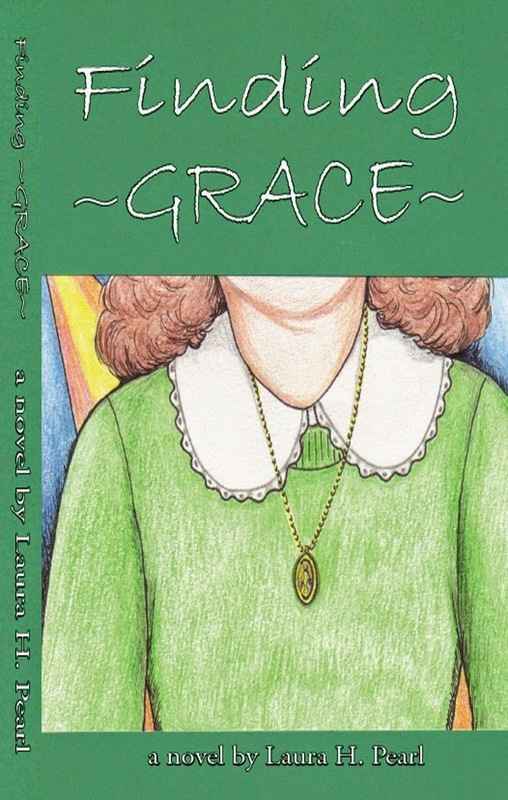 I have moved onto the third of three Catholic YA novels that I was asked to review, which is Laura Pearl's Finding Grace. 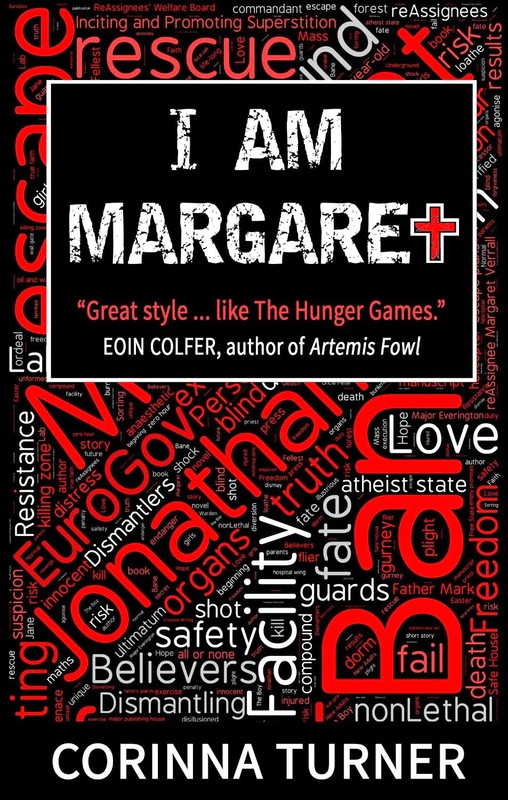 This is another bargain on Kindle ($4.99) so if you'd like to download and read along with me, have at it! I'm hoping to post my review this coming Wednesday or the week following, depending on how much reading I get in this weekend. -7- *sniffs* Is that a cool nip I feel in the air? August, to me, means that cooler evenings are on the way, and this is always exciting for me. 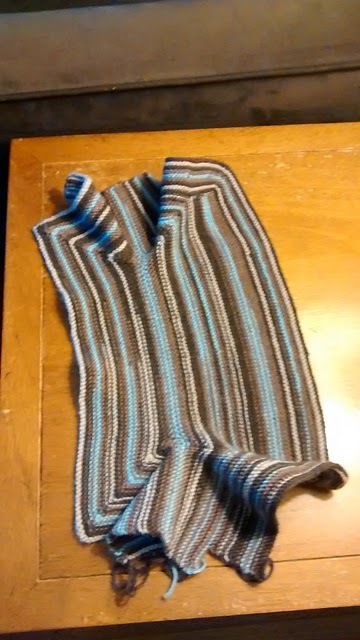 Because it means that FALL is coming, and you all know how utterly *insane* I am about the fall. It is my absolute favorite season, and I look forward to it each and every year. I plan leaf-filled outings. I knit orange sweaters. I take my children to visit alpaca farms. We drink spiced cider. I buy anything labelled "pumpkin" that I can get my hands on, from food to yarn. I bake things with apples. I LOVE FALL. And it's coming. :0 Very excited over here. All right everyone, I have to get back to work. Have a wonderful weekend! I'll check back with you on Monday. 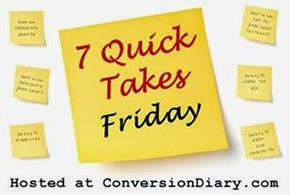 Don't forget to head to Conversion Diary for more 7 Quick Takes! So glad. 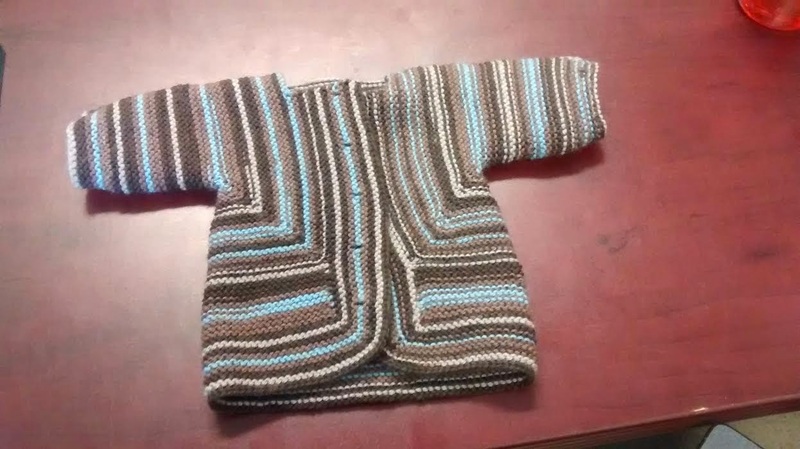 :) As soon as the buttons are sewn on, I'm winging it off to you!